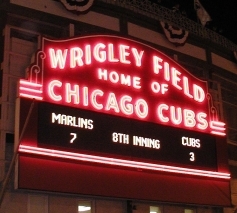 As I type this, we both know what’s going on in Wrigleyville – I can hear it all the way in California. So who do you see in the NL taking them out come playoff time? A month ago my head was swimming with dreams of the Brandon Webb-Dan Haren-Randy Johnson trio putting the nail into the past century’s coffin while it filled with nightmares of the Twins taking the AL Central. Today’s standings show things have changed, to say the least. So it’s not going to be the Diamondbacks. And honestly, look around the National League: do you really think any of these other teams are going to stop them? In most years we could count on the North Siders to dig their own graves, but (you don’t know much physical pain this causes me to type) the 2008 Cubs are probably the best team in the National League. Yes, the NL Central is a joke that isn’t funny anymore and yes, anything’s possible in the playoffs, but who can you really see pulling off the upset over there? The Mets can’t even win when the best pitcher in the sport takes the hill; the Philles have a 1.5-man rotation and the Dodgers are really just an idealized clone of the Sox. The Brewers, as much as I’m pulling for them and as much as they’re the only NL team I really endorse, are a long shot at this point. So what are we left with? It’s not that it wasn’t fun in years past to watch the Diamondbacks, Marlins, Braves, Giants and Padres do the dirty work – because believe me, it was – but this may be the year the Good Guys finally get to put on the kill themselves. No more of these strange Wild Card or West Coast teams getting all the gory fun; the time has come for the South Siders to drive a rusty, silver and black shank into the heart of every Small Bear in the world. As long as the Sox are still alive, I say let the Cubs live as well. Let them live. . . and then let them die. Dare I say it? Yes, I dare say it: Go Cubs. Go nowhere, then go straight to hell, but go there fast and without hesitation. May horrible, horrible failure await at the end of the road, and may it be the Good Guys in black who deliver it to you. Questions and comments can be sent to the 35th Street Post Office at letters@sox35th.com. Whether or not the Sox make it that far, that picture is still awesome.